There’s no better way to lose weight and save money, than with good homemade cooking, if done correctly. However, it’s quite likely that you’ll want to eat out every now and then. Whether you’re going out with friends or there’s a certain place that makes the best guacamole, there’s absolutely no reason to deny yourself the pleasures of restaurant dining every so often, even if you’re on a budget and trying to live healthily. Just like with anything else in life, there’s a positive, intelligent way to go about eating out on a budget, and then there’s the not-so-good way. 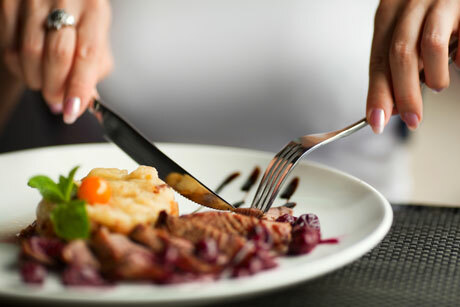 Here are a few tips on how to eat healthy, that will also save you money when eating out. First, try going out for lunch rather than dinner. Most restaurants are cheaper at lunch and the food is just as good. Many restaurants even offer special business lunches, which have multiple courses and are usually steals. Even better, lunch food has a tendency to be lighter than dinner courses, so eating out at lunch may offer you healthier choices than the dinner menu will. If the place you love to go to has large portions, try dining out with another health conscious friend and split the plate. The truth of the matter is that the vast majority of restaurants have enormous portions, and digging in to that chilli dog meal alone is an excellent way to blow your calorie count out of the water for the rest of the day. Alternatively, ask for a doggie bag and take half your meal home to eat later – after a spot of exercise, perhaps! Order vegetarian. Many restaurants these days offer vegetarian options, or will at least listen if you tell them to hold the meat. This of course depends on what kind of restaurant you are at. You will unlikely be able to ask the chef making you a burger, to “hold the meat”. However, if there is a vegetarian option available, it’s likely to be lower in calories and just as delicious as its meat-laden counterpart. Lastly, make a point of skipping dessert. Now, one of the cardinal rules of dieting is not to be overly cruel to yourself, but the fact of the matter is that a giant sundae is likely to have more calories than your entire meal combined, and will definitely add some dollars to your bill. Enjoy eating out, of course, but don’t go overboard! If you have your own tips and ideas for eating out on a budget, and keeping it healthy, we’d love to hear them in the comments below.